To show the unfolding of a project, or progress on a building site – events which take weeks, or months or even years – it becomes necessary to compress the timescale. With long-term time-lapse photograph we can get a much quicker visual overview of how the project developed. 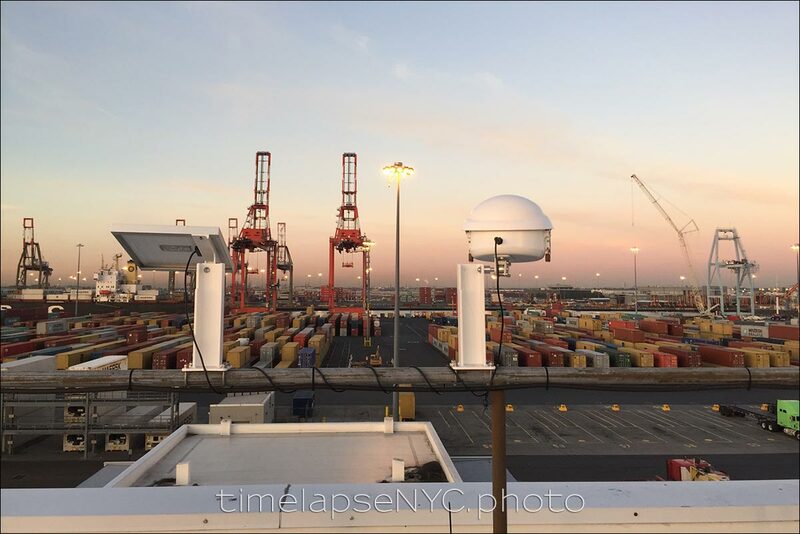 The photo at the top shows a camera installed for a project at Port Newark Container Terminal (PNCT). The camera is protected inside that white dome – a weather-proofed housing. Since long-term time-lapse really is that — long-term — the camera and timing device need to be powered by a solar panel, which can be seen to the left of the camera housing. This is all mounted sturdily in a good vantage point. This particular project took 3 years to complete! During that time, the camera took a photo every 10 minutes, from 5am to 7pm. Of course, for the final video, I discarded dead time and weekends. The final video is 20 minutes long, which is only of interest to the project managers perhaps. It will be too long to hold the attention of the causal viewer, but for the team involved with the project, it gives a superb overview of the progression of the renovation project on this PNCT gate. I provided my client 6 different condensed versions, with this video below being the 2 minute version, where I only left development that was visually interesting. After the demolition of the existing old buildings in 2016, construction started, and it finally wrapped up in November 2018. The camera’s view is wide, with a lot of detail recorded, which allowed me to zoom in during post-production to various sections as work progressed. This shorter snippet shows the initial stage of this massive renovation project, where the old warehouses were demolished. This part of the project took 2.5 weeks, and this 45 second clip shows the continuous momentum of the demolition taking place, sunshine or rain. PNCT during the Jan 2016 blizzard. The blizzard occurred on Saturday, Jan 23. I pulled 6 days of footage around the blizzard to show the the day before the blizzard, (Jan 22) as well as the days afterward while the area was being cleaned up. Then, back to business as usual.